In July of 2013, South Sudan marked two years of independence, but for the millions who continue to face famine, disease, displacement, and crippling poverty will be hard pressed to find any reason to celebrate. Some 11.3 million Sahelians are estimated to be short of food this year, and as of May 2013, 345,000 acutely malnourished children have been treated via UNICEF and NGO-run nutrition centers. Despite these avenues of nutritional support, statistics show malnutrition rates of more than 10 percent in almost all of the countries, and above the 15 percent in parts of Chad, Mauritania, and Niger. Water and sanitation are also ongoing concerns. Civil unrest in the Sahel has contributed to its decline; terrorism and violence have forced millions of people to flee their homes, and constant drought and widespread famine make escaping those danger impossible. We can't throw short-term ideas at the problem; we must help promote the structural development of the Sahel's nations to help them build sustainable communities that are resilient to civil issues. This means investing in initiatives that develop agricultural productivity and access to food and water, and helping citizens prepare for potential drought. 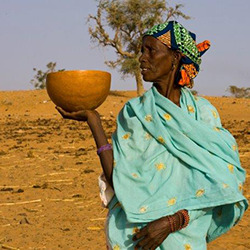 Write to the United States Agency for International Development (USAID) asking it addresses the foundational causes of the Sahel's issues rather than simply responding to the immediate emergency there. The ingredients of a crisis have all come together to create a dangerously critical situation in the Sahel region of Africa. Widespread civil unrest has caused millions of people to flee their homes in search of safer accommodations, but in the Sahel, there is virtually no such thing. Drought and subsequent famine rage through the region, to the degree that 11.3 million Sahelians are estimated to be short of food this year and 1.5 million children are acutely malnourished. People like children and the elderly whose immune systems are already compromised are at especially high risk of sickness and death from lack of water and adequate nutrition. But while violence cannot be predicted, we can anticipate drought and famine. Instead of throwing billions of dollars at an immediate emergency, we need to help nations within the Sahel rebuild their infrastructures, from the ground up, in an effort to push them into food and water independence. This means investing in programs that encourage agricultural productivity and access to food and water. It means helping Sahel Africans spot and prepare for potential food insecurity. Please continue to aid in the Sahel's recovery by promoting long-term solutions that tackle issues at their core. That's 16,327 signatures! Let's keep the ball rolling.